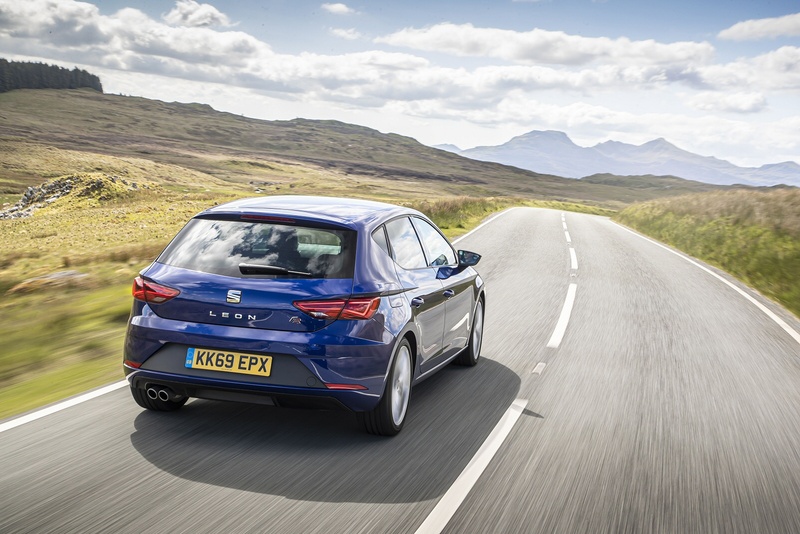 If you'd like your family hatchback with a dash more attitude than the normal bland box, look to SEAT and its striking Leon, now improved with smarter looks and extra media connectivity. With the car benefiting from the best engineering that the Volkswagen Group can offer, think of it as a Golf with a sharper suit and a keener price tag. Oh, and a bit of a sporty feel in racy FR Technology form. It took quite a while for the public to warm to the radical step change that SEAT introduced when it moved from the hugely popular Mk1 SEAT Leon of 2000 to the bigger and slicker second generation car introduced in 2005. That's often how it is when radical designs are introduced. Many of the cars that we slated as being ugly now look really good. The Leon was never ugly but some of the other designs spun off that styling theme in the SEAT line up weren't the happiest looking things. The benefit of hindsight shows that the Leon was the best interpretation of ex-Alfa man Walter da Silva's design language. 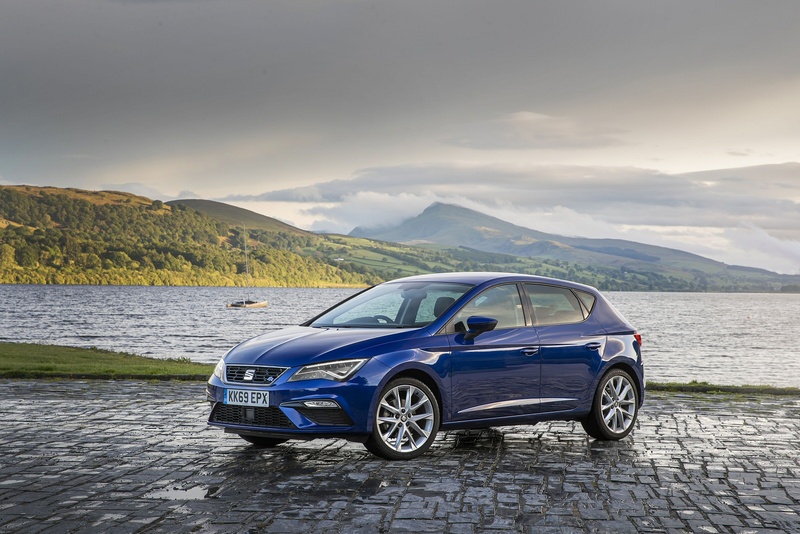 It never reprised the sales success of the original, and SEAT is looking to kick start interest in the Leon line with an improved third generation model that looks tauter and subtly more modern. Especially in the sporty FR Technology form we look at here. Still want that Golf? 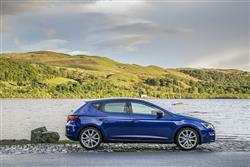 The Leon made its name as a sporty selection and the latest line-up is powered by efficient yet powerful TDI diesel and TSI petrol engines. In FR Technology spec, you choose between a 150PS 1.4-litre EcoTSI petrol unit or the 2.0-litre TDI diesel with either 150 or 184PS. 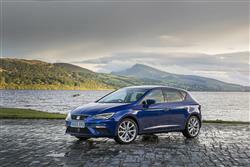 The Leon FR hot hatch features an interesting function called SEAT Drive Profile. This allows the driver to vary the characteristics of the power steering, throttle control and even the engine sound via a sound actuator using three modes: eco, comfort and sport. There is also a facility to tailor the settings according to the driver's preference. The interior ambient LED lighting changes according to the selected setting: white in eco and comfort modes, and red in sport. No red mist please. FR models get firmer suspension and wider tyres than standard variants, but even here, the ride balance is one you'll be happy to live with in the traffic jams, urban jungles and motorway mileages of real life. There's an extra dash of spirit in this car which for some reason, I just don't feel in an apparently identical Volkswagen Golf. Perhaps the sportier styling and more dynamic brand image that this SEAT has lead you to push it that little bit harder, revealing unexpected handling talent that a Golf or an Octavia could also offer if only given the chance. Maybe. But somehow I doubt it. As before, Leon FR Technology buyers choose from either a five-door hatch, an 'ST' estate model or an 'SC' three-door coupe. 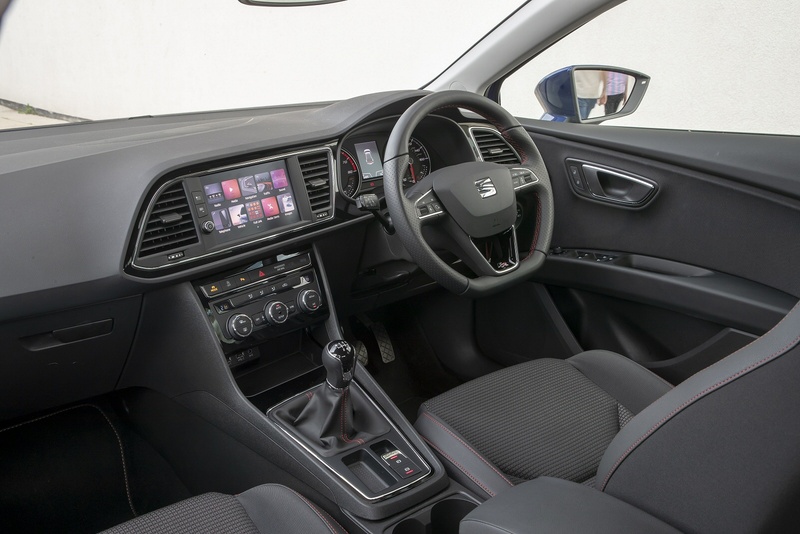 In all three cases, SEAT says that visual style was one of the key reasons why people bought the original version of this car, so it wasn't necessary with this facelifted version to change the aesthetics too much. A few tweaks though, have been made. At the front and rear, there are revised bumpers and bodywork with sharper, more assertive lines, plus there's a smarter chromed front grille. Otherwise, it's as you were, the FR trim level including a well-judged bodykit that lifts the look of the standard shape a small but significant amount. Inside, the ambient lighting LEDs' intensity can be regulated as the driver wishes from the newly redesigned eight-inch central infotainment screen. This monitor eliminates the need for many of the buttons and dials that were scattered around the fascia on the previous model. From this monitor, the LED ambient lighting of the cabin can be dimmed or intensified, giving the interior a classy feel. Otherwise, things are much as they were before, which means that passenger space is very class-competitive and there's a decently sized 380-litre boot in the hatch model. If you need more space than that, the ST estate offers 587-litres. 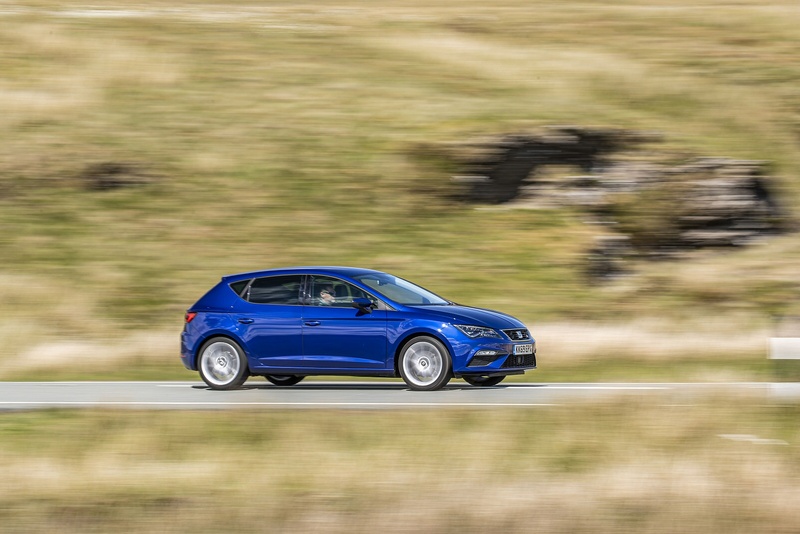 FR Leon buyers get the choice of five-door hatch, three-door SC Coupe or ST estate bodystyles and they can choose either a 6-speed manual or a DSG automatic gearbox. Pricing starts at around the £21,500 mark for the 1.4-litre EcoTSI petrol hatch variant. You'll need around £900 more for the 2.0 TDI 150PS diesel variant. As well as a sportier look, this outlay buys you smart titanium 18-inch alloy wheels, a navigation system, a high quality stereo sound set-up with sub-woofer and full LED headlights. There are key changes with regard to media connectivity, this revised Leon featuring the latest generation of the brand's 'Easy Connect' infotainment systems, activated by this model's new 'Media System Plus' eight-inch screen. Customers can also specify a 'Connectivity Box' in the central console that enables wireless smartphone charging. 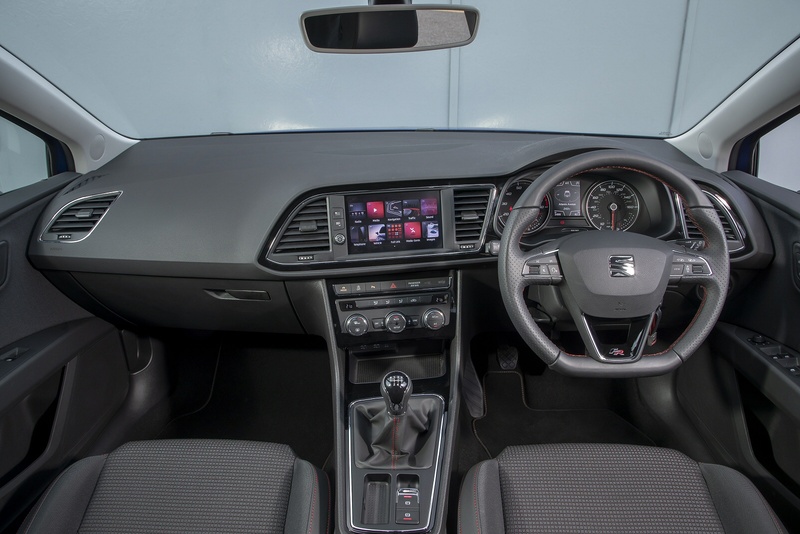 And there's the brand's 'Full Link' system, which enables you to use apps from your smartphone on the fascia screen via either the 'Apple CarPlay' or 'Android Auto' media systems. 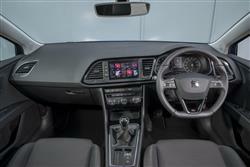 This improved Leon also features many more options when it comes to electronic safety systems. Examples of this include 'Traffic Jam Assist', which virtually drives the car for you in stop/start traffic. And a 'Pedestrian Protection System' which scans the road ahead not only for other vehicles that might pose accident hazards but also people too. It's not easy to cut back the weight of a modern family hatchback in a market where buyers want their cars to be safer and more heavily equipped. 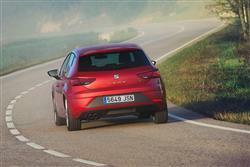 Yet thanks to the use of the Volkswagen Group's MQB platform, this SEAT manages to be very competitive in this regard. There's also a Start/Stop system that cuts the engine when you don't need it, stuck in traffic or waiting at the lights. Plus an Energy Recovery system that stores brake energy usually lost as heat and uses it to help power the car's electrical systems, ultimately preserving fuel. 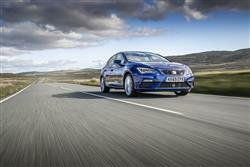 All part of what SEAT calls 'Ecomotive technology'. The 2.0 TDI 184PS variant manages 62.8mpg on the combined cycle and 121g/km of CO2 in ST estate form. Or 67.3mg and 112g/km in 150PS 2.0 TDI guise. Don't automatically tick the box for a TDI diesel Leon FR though until you've properly considered the petrol proposition. For the 1.4 EcoTSI, the figures are 60.1mpg and 114g/km. Bear in mind that if you go for an 'FR Technology' specification Leon, then your car with come with a 'Drive Profile' system incorporating an 'Eco' mode. This helps you maximise your running cost returns by trimming the air conditioning back, indicating the best gear change points and prompting a coasting mode on the motorway when a DSG gearbox is fitted. If you�re looking for a new SEAT Leon 1.4 TSI 125 Xcellence Technology 5dr [Leather] Petrol Hatchback for sale, you�ve come to the right place. 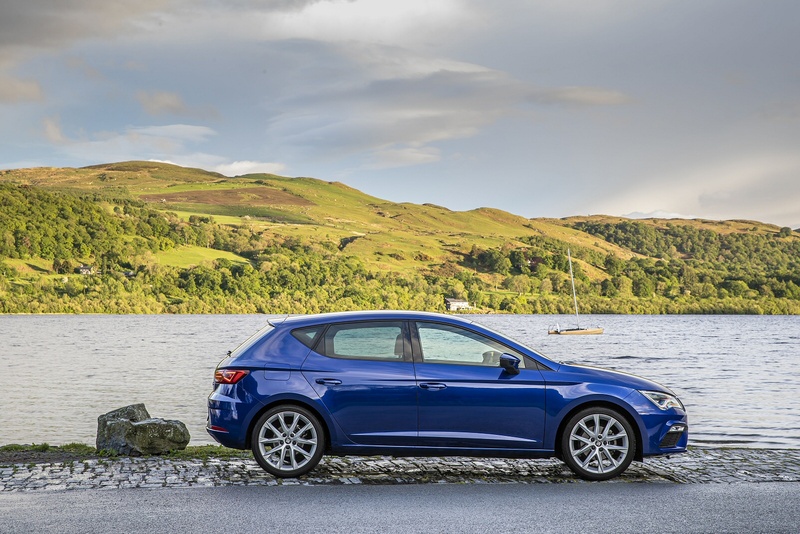 At Bristol Street Motors we don�t just have the best SEAT Leon 1.4 TSI 125 Xcellence Technology 5dr [Leather] Petrol Hatchback deals, we also offer friendly advice and help with all your enquiries to ensure your buying experience is a happy experience.